As MoDOT, legislators, and stakeholders across Missouri work to find solutions to MoDOT's funding crisis, works to build support for a proposed $8 billion statewide transportation funding initiative--that will, for the first time, allow state transportation funding to be spent on bicycling, walking, and transit projects--MoBikeFed has worked with organizations across Missouri to evaluate MoDOT's policies, plans, and projects. Fully include bicycling and walking in all state transportation funding proposals, in accordance with MoDOT’s stated goal of expanding and improving bicycle and pedestrian options throughout the state. Create and implement a Statewide Bicycle and Pedestrian Plan, including a timeline for creation of regional Bicycle and Pedestrian Plans in each of Missouri’s transportation planning regions; resume meetings of the statewide Bicycle/Pedestrian Advisory Committee. 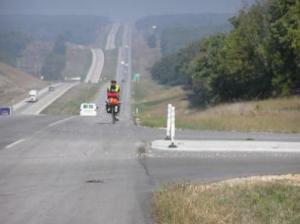 Improve the state’s rumble strip design guidelines to include more bicycle friendly elements. Build upon MoDOT’s current program that routinely considers sidewalk and ADA needs in all projects, to more thoroughly consider needs of all nonmotorized users, including those of bicyclists, in all projects. Dedicate more funding to meeting those needs. Better integrate the needs of cities, towns, and populated areas into the MoDOT decision-making process--weigh MPO and city/town needs higher at the District & Statewide levels; apportion TAP and similar funds directly to small MPOs to help cover their identified bicycle and pedestrian transportation priorities. The improvement MoDOT has made in recent years in accommodating biking and walking has been dramatic. As late as the early 1990s, MoDOT quite literally had no bicycle or pedestrian policies or procedures and did not work to accommodate safe bicycling or walking under any circumstances. 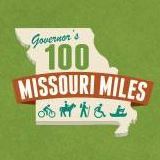 MoDOT bitterly opposed spending any of Missouri's federal transportation dollars on bicycling, walking, or trails projects and opposed the federal requirement to use a small amount of those federal dollars to hire a statewide Bicycle and Pedestrian Coordinator. So to move from those policies of the early 1990s to the current extensive MoDOT bicycle, pedestrian, and ADA policies has been nothing short of dramatic. In addition, the MoDOT Planning Framework for Transportation Decision Making creates a process of local control and input on major transportation decisions in each part of the state. MoDOT's Planning Framework, with its emphasis on local control and input in making transportation funding decision and setting priorities, is one of the few areas where Missouri is truly a national leader among state DOTs. Many state DOTs still depend on a monolithic, centralized transportation decision-making process that gives short shrift to local input. What that means for bicycle and pedestrian advocates around Missouri, is that citizens and groups in each area of the state can work with their local Metropolitan Planning Organization and/or Regional Planning Commission to make real change in the direction of your local transportation funding and priorities. This has been a very successful approach over the past twenty years, and several of Missouri's MPOs and RPCs have bicycle and pedestrian policies that are far ahead of the statewide situation. MoDOT has recently adopted a statewide Long Range Transportation Plan, that for the first time fully integrates bicycling, walking, and transit MoDOT planning. In working to meet the high standard set by other state DOTs across America for accommodating people who bicycle and walk, MoDOT now has a boost, because the recently adopted Long Range Plan has as one of its four main goals, "Give Missourians Transportation Choice." We applaud MoDOT's adoption of that important goal and urge MoDOT to work toward adoption of our recommendations below and, in general, to work to adopt the highest standards for accommodating bicycling and walking as an integral part of the statewide transportation system. Work with citizen groups and stakeholders to develop and adopt a complete, comprehensive, realistic, and effective statewide Complete Streets policy as required by the FAST Act (Dec 2015) and encourage all Missouri MPOs to do likewise. Continue to improve integration of bicycle and pedestrian planning and evaluation into every road and bridge project, starting at the earliest planning and scoping stages. Every MoDOT road and bridge project should be seen and used as and opportunity to create connectivity and remove barriers for bicycling and walking. Calculate and track Pedestrian Level of Service and Bicycle Level of Service on every road and highway project where those travel modes are allowed. Require high level approval of any decision to omit bicycle or pedestrian facilities on a road or bridge project. Require an even higher level of review if the reason for omission is anything except “not legally allowed to travel on this roadway”. Ask for a review of MoDOT’s current policies by the National Complete Streets Coalition and work to adopt any recommended changes. Shoulders--shoulders are very important for safe bicycle and pedestrian access on rural roads and highways. They are cost-effective and they improve safety for motorists, bicyclists, pedestrians, motorists with disabled vehicles, law enforcement, ambulance and tow truck workers, transit and school bus operators and users, and road construction workers. We support a statewide, comprehensive initiative to build and maintain shoulders on all MoDOT roads that lack them, prioritizing the work according to traffic and need. Shoulders and rumble strips--follow the FHWA guidelines for roads where bicyclists are allowed to operate for all MoDOT roads in Missouri. Rumble strips should not be used when they leave less than four feet clear space to the edge of the pavement (five feet if a curb or guard rail is installed). Sidewalk assessments--MoDOT has worked with Regional Planning Commissions across Missouri to create comprehensive sidewalk assessments in every Missouri community with population 2000 or greater. Now those assessments should be turned into prioritized sidewalk needs lists, and funding set aside annually to address the top priority needs. Sidewalks on MoDOT roads in built-up areas--All MoDOT roads in cities, towns, and other built-up areas should include appropriate sidewalks, crosswalks, and other pedestrian access. In most Missouri cities and towns, the MoDOT roads are the busiest, the most congested, provide the most access to shopping, work, schools, businesses, and other destinations--and are also the most unfriendly and dangerous for pedestrians. MoDOT should comprehensively address this issue. Bicycle and Pedestrian connectivity and safety near schools--MoDOT's Safe Routes to School Program has been very successful over the past several years in providing funding to create safety and connectivity for children who bicycle or walk to schools. MoDOT should continue this program with the new funding, prioritizing project needs and allocating a certain amount of funding each year. Cross-state bicycle routes--MoDOT should continue to work to officially adopt Missouri's seven cross-state bicycle routes into the U.S. Bicycle Route System and to mark and sign the cross-state and cross-country bicycle routes that pass through Missouri. MoDOT should continuously work to improve conditions for bicycling on these recognized cross-state routes. Pedestrian access: MoDOT intersections in buillt-up areas or where there is any pedestrian demand, must be built for safe and convenient pedestrian access. Retrofit: Many older intersections have no pedestrian crosswalks, signals, or access. MoDOT should assess, prioritize, and systematically address these intersections. Crosswalks on all sides of every intersection: Many newer MoDOT intersections in high-traffic areas include pedestrian crosswalks on only three of the four sides of the intersections. This is both unfriendly and unsafe for pedestrians, who are tempted to save time by crossing on the leg without a crosswalk (and typically without allowances in the signal timing to allow safe pedestrian crossing). These 'three legged' intersections should not be an allowed design, and existing intersections with this feature should be systematically upgraded. Bicycle detection: Many existing and even newly installed traffic signals do not properly detect bicyclists. This is such a common problem that the new "Dead Red" law in Missouri now allows bicyclists to cross at any traffic signal that does not detect the bicycle and cycle properly. Every new traffic signal should be designed and adjusted properly detect bicyclists. Old traffic signals should be properly adjusted to detect bicyclists. Where needed, intersections should be marked to show bicyclists where to position themselves to trigger the traffic signal change. Experience shows that nearly all existing traffic signals in Missouri can be adjusted to properly detect bicycles. Recent improvements to MoDOT bicycle, pedestrian, and ADA policies have been accompanied by routine training of staff on these issues. This training has had a positive impact. Lack of statewide, long-term, strategic planning for bicycling, walking, and trails has long held Missouri back from reaching its potential for bicycling and walking. MoDOT's Bicycle/Pedestrian Advisory Committee created a bicycle/pedestrian strategic plan, the Trailmap for Bicycling and Walking, 2005-2007. 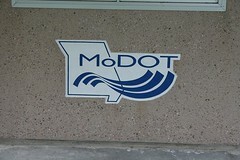 The Trailmap has been very influential, but was never officially adopted by MoDOT. MoDOT's 2007 Long Range Plan gave very short shrift to bicycling and walking. 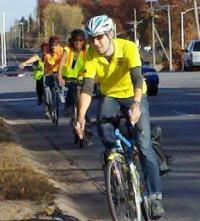 Create, maintain, and implement local bicycle, pedestrian, and trails plans for each MoDOT District, MPO, and RPC area. Note: The plans and project lists may best be accomplished as part of existing Long-Range Plans (like the current Missouri On The Move LRTP) or as separate, self-standing plans. With its system of regional transportation planning partners, MoDOT is in many ways in the national forefront of of the movement to incorporate local decision-making and priorities into statewide transportation decision making. MoDOT has made major improvements as it has worked to adopt this system over the past couple of decades. Representatives of health groups, community groups, bicycle groups, transit groups, pedestrian groups, and trails groups as an ongoing, integral part of the MPO and RPC decision-making process and on Transportation Advisory Committees. More involvement and input from bicycle, pedestrian, and transit interests when project lists from RPCs and MPOs are combined at the MoDOT District Level. This has been identified by our stakeholders statewide as the portion of the project prioritization process where bicycle, pedestrian, and transit priorities that have tremendous local support and that are very cost effective are simply eliminated with no opportunity for input, feedback, or participation in the higher-level project selection process. Apportionment of federal TAP, SRTS, and other similar funds to small MPOs so that they can make locally appropriate decisions according to local priorities, without being overruled by other priorities at the District level. This system works well for the large MPOs--now is the time to expand it to small MPOs (St. Joseph, Columbia, Jefferson City, Joplin, Cape Girardeau) as well. The issue in each of these cases is that cities, towns, and populated areas within the MoDOT Districts generate a very large portion of the tax dollars that support MoDOT's work. These cities and town typically have identified bicycle and pedestrian priorities as part of their transportation priorities within their MPO and municipal boundaries. However, the power structure of the MoDOT District is set up to disfavor the interests of the populated portions of the District. For that reason, the identified bicycle, pedestrian, and transit priorities of these portions of the district is not carried through at the District or statewide levels. This creates conflict and dissatisfaction with MoDOT priorities and undermines the creation of a cohesive regional and statewide approach to Missouri's transportation needs. To remedy this issue, these communities and their issues, including support of comprehensive transportation connections for their citizens who walk, bicycle, and use transit, must receive a full voice in MoDOT's operations and decision making. In the past few years, MoDOT has made very positive progress in tracking specific measures and creating specific goals for bicycling and walking in Missouri. MoDOT's Tracker now tracks specific measures of progress for bicycling and walking in Missouri, like how many Missourians bicycle and walk, how much money MoDOT spends on sidewalk projects, trends for bicycle and pedestrian injuries and fatalities, and whether Missourians feel that the bicycle and pedestrian systems in their communities are safe and connected. (current goal is simply 'increase'). Create specific goals for decreasing statewide injury and fatality rates for both bicycling and walking; Implement effective bicycle and pedestrian Safety Performance Measures as required by the Federal Highway Administration as of March 2016 (current goal is simply 'decrease'). Track bicycle and pedestrian injuries via the more comprehensive DHSS InjuryMICA system as a complement to the current STARS system. STARS misses over 90% of bicycle injuries in Missouri. Use InjuryMICA on an equal basis to STARS--or even on a superior basis for those areas like bicycle injuries where InjuryMICA is clearly superior--for determining grant and safety funding and priorities. For each project in the STIP, track which bicycle and pedestrian-related elements are included. If bicycle/pedestrian elements are excluded in a particular project, track that information in the STIP as well, along with the reason for the omission. This will allow tracking of which projects include appropriate bicycle and pedestrian elements, which omit them for justifiable reasons (biking/walking not allowed, etc. ), and which omit them for reasons that are not justifiable. Track which MoDOT projects on the STIP are on local or regional bicycle, pedestrian, and trails plans and whether or not the MoDOT project includes the elements the local plan requires. Institute comprehensive community health assessment of all MoDOT plans and projects. Fix a misleading poll question about citizen support for bicycling and walking: MoDOT currently asks an annual survey question about citizen support for bicycle and pedestrian funding that is very biased. Considering the biased and misleading nature of the question, the amount of citizen support the question has shown for bicycle and pedestrian funding in Missouri is quite astonishingly. But MoDOT should transition to a question that is fair and will better show the real state of citizens support for or opposition to spending our transportation funding on removing barriers to safe bicycling and walking, such as, "Do agree or disagree with this proposal: Bicycle and pedestrian accommodations should be included road and highway projects whenever omitting them from the project will create a significant barrier to safe bicycling and walking for residents in the area." Prioritize bicycle and pedestrian connectivity and safety on par with other transportation modes in the Blueprint to Save MO Lives and other safety plans, measurements, and goals. Implement effective bicycle and pedestrian Safety Performance Measures as required by the Federal Highway Administration as of March 2016. Provide necessary support and administrative personnel for bicycle and pedestrian programs and implementation. MoDOT currently has a Nonmotorized Transportation Engineer and a Safe Routes to School Coordinator. The extensive training, project review, and implementation of bicycle and pedestrian projects and policies across MoDOT's 34,000-mile system requires more staff, and states with successful bicycle and pedestrian programs have more staff. 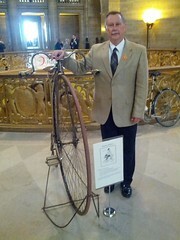 Fully incorporate appropriate bicycle and pedestrian representation on all relevant committees and boards where decisions are made and priorities set for the use of Missouri transportation and highway funds. Work with MoDOT Districts, Metropolitan Planning Organizations, and Regional Planning Commissions to ensure that bicycle and pedestrian interests and organizations and represented on their committees. Statewide Bicycle/Pedestrian Committee: Reconstitute the MoDOT Bicycle/Pedestrian Advisory Committee mandated by the Missouri Highway and Transportation Commission in the late 1990s, or support creation of a similar statewide committee hosted outside of MoDOT.